아시아 각국의 젊은 의사들이 우리나라 여러병원에서 2주간의 training을 받는 프로그램이었습니다. 각자 짧은 presentation을 하였습니다. 저는 첫번째 세션의 discussant로 참여하였습니다. 흥미로웠던 발표 몇 개를 요약합니다. 주로 EVL 후 발생한 EVL ulcer로 인한 refractory esophageal bleeding을 self-expandable esophageal covered metal stent (SX-Ella DANIS stent, Czech Republic)로 치료한 경험을 발표하였습니다. 마침 같은 stent 제품을 사용한 연구가 2016년 6월 Hepatology지에 발표되었습니다 (Escorsell A. Hepatology 2016). Results: Twenty-eight patients were randomized to Sengstaken-Blakemore tube (n = 15) or SX-ELLA Danis stent (n=13). Patients were comparable in severity of liver failure, active bleeding at endoscopy, and initial therapy. 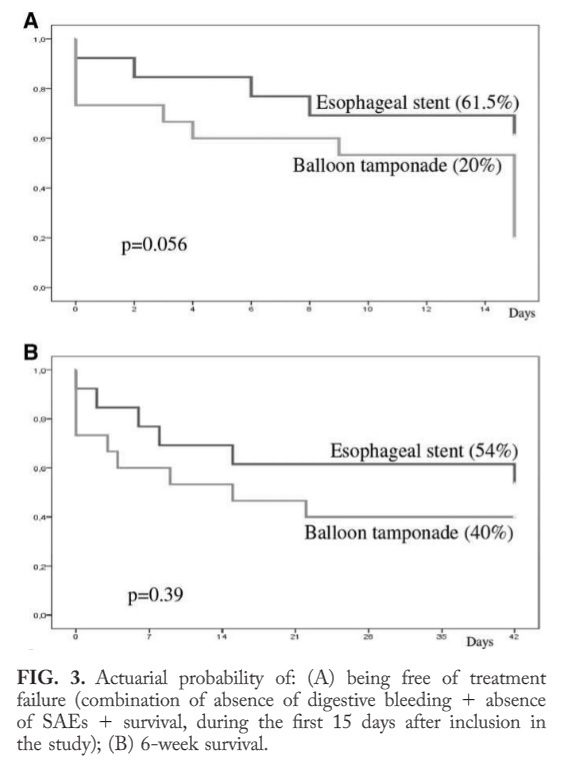 Success of therapy was more frequent in the esophageal stent than in balloon tamponade group (66% vs. 20%; P=0.025). Moreover, control of bleeding was higher (85% vs. 47%; P=0.037) and transfusional requirements (2 vs 6 PRBC; P=0.08) and SAEs lower (15% vs. 47%; P=0.077) in the esophageal stent group. TIPS was used more frequently in the tamponade group (4 vs. 10; P=0.12). There were no significant differences in 6-week survival (54% vs. 40%; P = 0.46). Hepatology에 실린 작은 규모의 연구였지만 결과는 인상적입니다. Refractory variceal bleeding은 매우 험한 상황입니다. Survival graph의 dimension이 6주였습니다. 6 week survival rate!!! 논문의 discussion에서 일부를 옮깁니다. "These better results are owing to both a greater hemostatic effect and a lower rate of SAE, especially of aspiration pneumonia, with the use of esophageal stents. Because esophageal stents can be left safely in place for over 5 days, this procedure would be specially valuable for centers with-out facilities for early TIPS." TIPS를 빨리 할 수 있다면 즉시 TIPS를 시행하는 것은 어떤가 생각해 보았습니다. Dr. Yasay 발표와 비슷한 증례를 저널에서 찾았습니다 (Yildiz. J Gastric Cancer 2016). (A) Gastroduedonal intussusception. (B, C) The mass protruding to the duedonum and causing obstruction (arrows). Also visible are stranding of the peripancreatic fat and fluid accumulation around heterogenously ehancing pancreas, a sign of early necrosis. (D) Macroscopic view of the mass arising from gastric corpus (arrow). 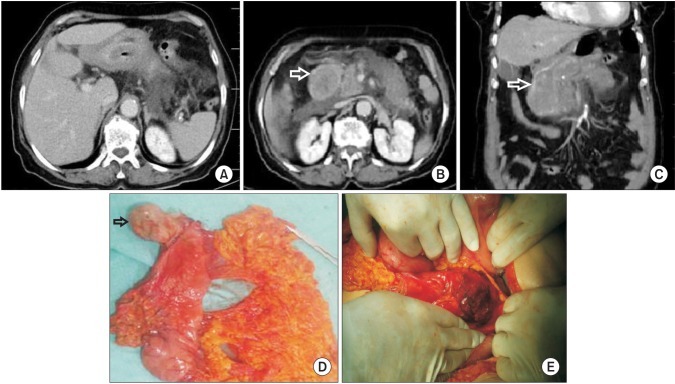 (E) Perioperative view of pancreas. Please note relatively dark portion of the pankreas corresponding to pancreatic necrosis. 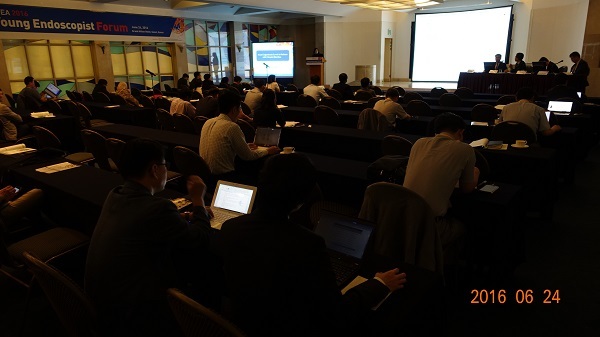 Methods: The workshop was a two day even held on June 2015. 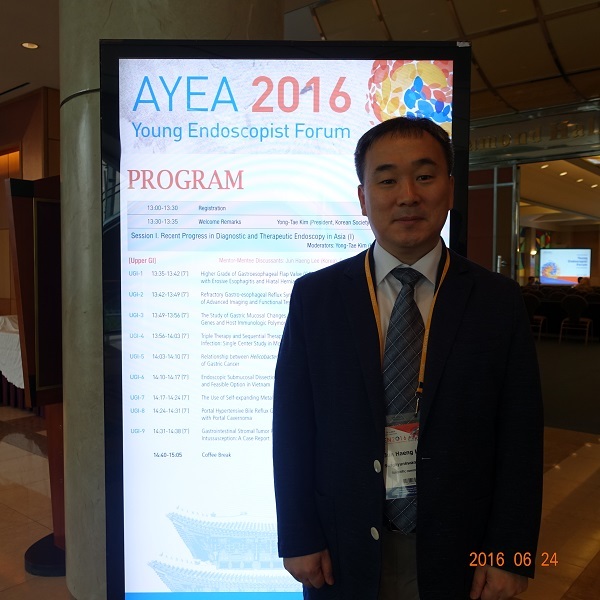 The program consisted of lectures, computer workstation for capsule endoscopy (CE), ex vivo models for single balloon enteroscopy (SBE) hands-on, and an interactive live demonstration with SBE. A twenty item multiple-choice written eam was administered before and after the lectures. Conclusion: SOD remains a challenging condition to treat needing recurrent procedures. High risk of management with ERCP, however our data shows low risk of pancreatitis in setting of well selected patients treated under propofol sedation by a skilled endoscopist. 뉴질랜드에서 propofol은 마취과 의사만 투여할 수 있다고 합니다. 물론 상당한 비용이 발생한다고 하네요. 일반적인 상부내시경이나 대장내시경은 midazolam sedation만 사용하고 있다고 하니 우리도 참고할 필요가 있겠습니다. Propofol은 매우 무척 대단히 엄청 놀랄만큼 무서운 약이니까요. Consider global health issues. Big questions. Think about the most important questions that are unanswered in the field. Find a question or a problem that excites or drives you. Don't be afraid. Get out of the silo of your own community and field. Stay up to date on journal reading. Prioritize. Plan ahead!! Do NOT tackle everything at once.